Although Red Lobster is known for seafood, many people yearn for the basket of cheddar biscuits that are served with every meal. Make this copycat version at home for your family. 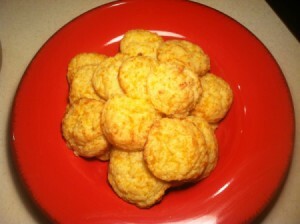 This is a guide about Red Lobster Cheddar Bay biscuits (copycat). Ever had the biscuits at Red Lobster? Well now you can save about a million bucks and make them yourself at home! :) These are really good. Source: Modified from a recipe in my cookbook, "5 Ingredients Or Less"
Combine your melted butter or margarine, cheese and sour cream. Add your flour and garlic powder. Mix well. You may put these in mini-muffin tins to bake. I just used a cookie scooper, it is about the size of a large tablespoon. Grease your pan, bake at 350 degrees F for 20-25 minutes, or until golden brown. Enjoy!